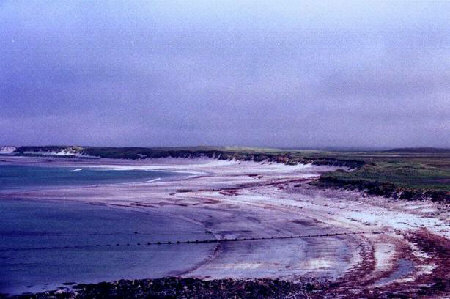 This is a picture of the Beach at Ballivanich on the Island of Benbecula. Benbecula is a low lying, windswept (VERY at times!) island between North and South Uist in the Outer Hebrides or Western Isles. Unfortunately it is probably best known for its rocket testing range and military base at Ballivanich. However, it also has historical interest in terms of its connection with Bonnie Prince Charlie and Flora McDonald. The beach itself is typical of those in the area with the The Outer Hebrides playing host to numerous large beaches, stretching across the western side of the southern islands.